Ah, the inevitable movie tie-in. In the tradition of Angry Birds: Rio and Doodle Jump: Hop comes Halfbrick’s Fruit Ninja: Puss in Boots [$0.99 / HD]. Apparently animated films go with popular iOS properties like peanut butter and jelly. But let’s not jump to conclusions. 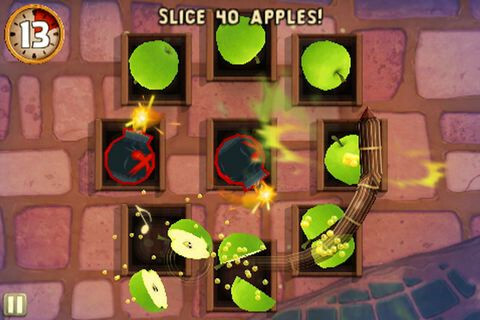 This Fruit Ninja is no lame license cash-in. It’s no replacement for the original game, but it’s a great complement. As we mentioned in our preview, it introduces Bandito mode, a fantastic addition to the family of Fruit Ninja’s [$0.99 / HD / Lite] game modes. And it adds a ridiculously popular feline mascot, for the folks who swoon at the idea of a swashbuckling kitty with a Spanish accent. Fruit Ninja: Puss in Boots boasts two game modes. Desperado, the first, is the classic game most of us know and love. You swipe the screen to slash fruit as they’re tossed up. Let one fall unslashed and you lose one of three lives, hit a bomb and it’s game over. The longer you go and better you perform, the higher you’ll place on the leaderboard in the end. Though plenty was left out of Puss in Boots — multiplayer, zen mode and arcade mode, specifically — one of Fruit Ninja’s best features returns: the Dojo, or in this case, the Stash. Meeting certain goals unlocks new blade and backgrounds, themed for the film. There are four extra blades and three extra backgrounds to unlock. Aside from the themed unlockables, this game feels far more Fruit Ninja than Puss in Boots. The core game is familiar and intact. but there are a few other nods to the upcoming DreamWorks film. The main menu is thematic, with a movie site option. The areas you visit in Bandito mode are from the film as well. I could take or leave most of the thematic elements, but the new Spanish guitar soundtrack is a great accompaniment to the gameplay. And Puss (or an Antonio Banderas sound-alike?) pipes up with encouragement as you play. Slicing fruit is entertaining enough on its own, but it sure is motivating to have someone shout “Aha!" or “Yeah!" whenever you do something cool. If you could only have one Fruit Ninja game on your phone, I’d tell you to keep the original. It has a lot more to offer. But Fruit Ninja: Puss in Boots is well worth playing, even if it’s more expansion than stand-alone. Any fruit-slicing fan will be well served by this game, so grab it — and swing by our discussion thread to let us know what you think.